Dangerous by design. Bike lanes along Gulf Boulevard in Pinellas County are so narrow that one consulting group says they’re putting cyclists within inches of danger. PINELLAS COUNTY, Fla. — Dangerous by design. 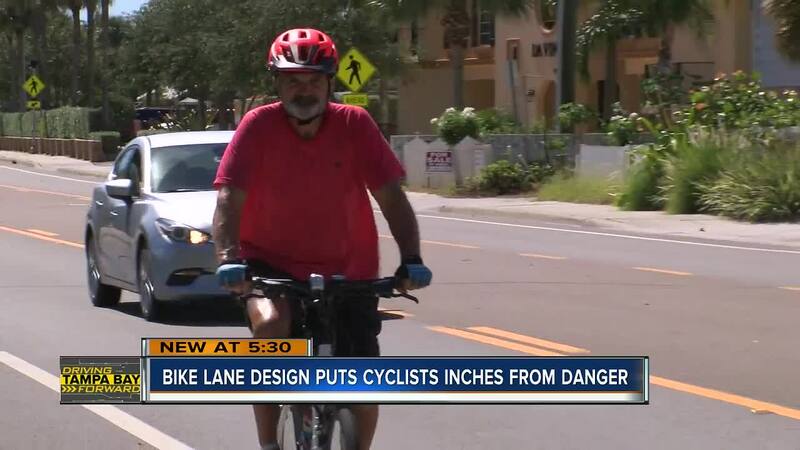 Bike lanes along Gulf Boulevard in Pinellas County are so narrow that one consulting group says they’re putting cyclists within inches of danger. Bike lanes along certain portions of Gulf Boulevard, including the stretch through Indian Rocks Beach, are just 3 feet wide. That makes them among the skinniest bike lanes in Tampa Bay. Cyclist Phillip Reitz’s nerves are rattled every time he rides along Gulf Boulevard and cars are forced to dart into the median to avoid hitting him. “They're just too darn close,” he muttered while taking a break from his bike ride Thursday afternoon. Reitz even making modifications to his ride to make it feel safer. “I had a bike with wider bars on it and I actually shortened it just because cars get uncomfortably close,” he explained. ABC Action News measured several bike handlebars and found that most are around 2 to 2 and 1/2 feet wide. If bike lanes are only 3 feet wide, that gives bikers just a few inches of space from passing cars. Nathan Whittle owns Rad Bicycles on Gulf Boulevard in Indian Rocks Beach. He's also skeptical of the narrow bike lanes. “I would call it more of a glorified gutter than a bike lane,” he joked. “At least once a week I talk to a customer that limps in or has some story about a car that clipped them or knocked them off the road,” he added. 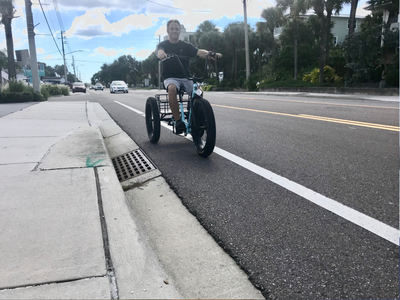 A new report by Icon Consultant Group in Tampa found bike lanes along Gulf Boulevard must be 4 feet wide to even be considered bike lanes and should be 5 feet wide to keep bikers, and walkers like Brad Pettit, safe. Pettit was hit along Gulf Boulevard a few years ago. “It was pretty scary rolling up the hood of a car,” he reminisced. “I was lucky. I’m glad I’m here today. I really am,” Pettit added. Pettit now advocates for more crosswalks and other safety improvements along Gulf Boulevard, which connects all of Pinellas County's coastal communities. Icon Consultant Group recommends narrowing the driving lanes along Gulf Boulevard in Indian Rocks Beach to 10 feet and expanding bike lanes to 5 feet across. They also recommend adding 8 new crosswalks at intersections along Gulf Boulevard, as well as taking out 3 underutilized crosswalks which are mid-block. The cost is around $1.1 million but is something Whittle says is worth every penny. “As a business owner of a bicycle shop and family man, I don’t ride my family through this area. We stick to the sidewalks and that's what I tell my customers too," he added. Pinellas County and the city of Indian Rocks Beach are considering applying for grants to make the safety upgrades. Crash statistics, according to Icon Consulting Group, found nearly twice as many bikers are hit here in areas of Gulf Boulevard with narrower bike lanes versus the sections with wider lanes.